Following on from last week's post about the Oxford Dictionaries Hindi word of 2018, Paper Republic have nominated their Chinese word of the year for the Year of the Dog, just closed. The Paper Republic translators collective promotes Chinese literature in English translation. It concentrates on new writing from contemporary Chinese writers. Paper Republic's word of the Year of the Dog, is (#)米兔. 米兔. 米兔. 米兔 means "rice rabbit", but it's pronounced mi-tu, so it represents the hashtag #MeToo. 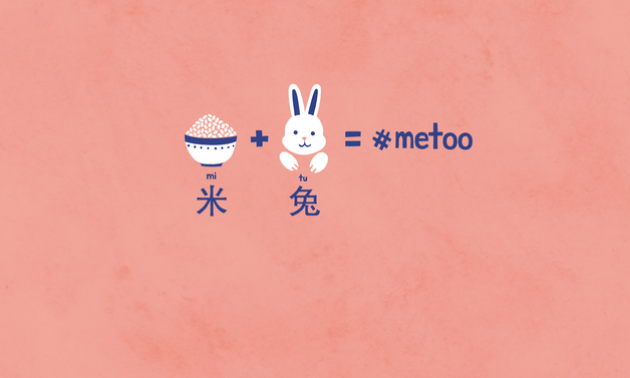 When sexual harassment stories first began to circulate online in 2018, the Chinese state censored most posts with the hashtag #MeToo, and netizens adopted the homonym "rice rabbit" instead. Paper Republic is always keen to give a voice to women writers. To dip a toe in the water, read the stories selected for Women in Translation month, and browse the short stories on Read Paper Republic, all completely for free.